The most prominent frameworks for developing these fat browser based clients are Angular and Angular 2, React.js, Ember, complemented by jQuery and a plethora of other libraries, components and frameworks (see for example this list of top 9 frameworks) . And then there is Vue.js. To be honest, I am not sure where Vue ranks in all the trends and StackOverflow comparisons etc. However, I did decide to take a quick look at Vue.js – and I liked what I saw. I have never really taken to Angular. It felt overly complex and I never particularly liked it. Perhaps I should give it another go – now that my understanding of modern web development has evolved. Maybe now I am finally ready for it. Instead, I checked out Vue.js and it made me more than a little happy. I smiled as I read through the introductory guide, because it made sense. The pieces fit together. I understand the purpose of the main moving pieces and I enjoy trying them out. The two way data binding is fun. The encapsulation of components, passing down properties, passing up events – I like that too. The HTML syntax, the use of templates, the close fit with “standard” HTML. It somehow agrees with me. Note: it is still early days and I have not yet built a serious application with Vue. But I thought I should share some of my excitement. And that is what appealed to me. The first thing I did to get started with Vue.js was to read through the Introductory Guide for Vue.js 2.0: https://vuejs.org/v2/guide/ . It is a succinct tour and explanation, starting at the basics and quickly coming round to the interesting challenges. Most examples in the guide work in line – and using the Google Chrome Addin for Vue.js it is even easier to inspect what is going on in the runtime application. The easiest way to try out Vue.js (at its simplest) is using the JSFiddle Hello World example. 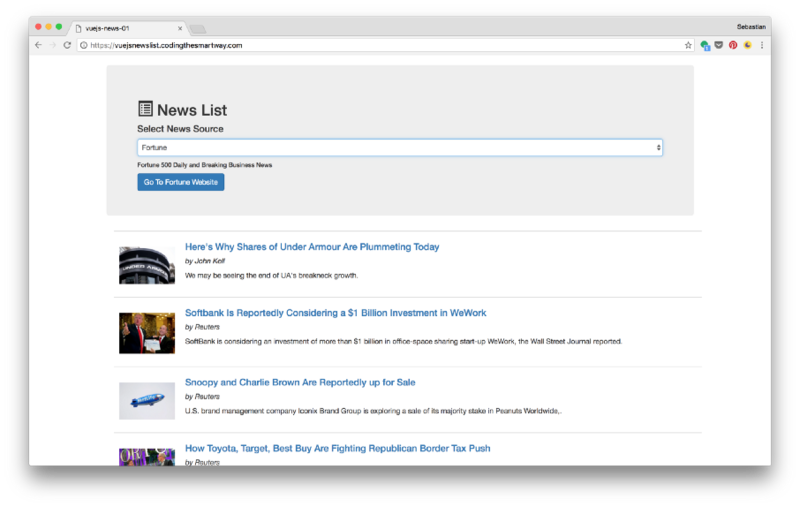 This example explains in a very enjoyable way how two components are created – news source selection and news story list from selected source- as encapsulated, independent components that still work together. Both components interact with the REST API to fetch their data. The article starts with an instruction on how to install the Vue command line tool and initialize a new project with a generated scaffold. If Node and NPM are already installed, you will be up and running with the hello world of Vue applications in less than 5 minutes.